Hermann, Mo. Hermann High School Athletic Director Todd Anderson announced moments ago that the Boys and Girls Hermann Tournament that was postponed last weekend due to weather has been rescheduled for Saturday with one exception. Note: The girls third place game between New Haven and St. Clair will be played on Wednesday February 5th at Hermann High School at 4:30 p.m. This is because New Haven already has a regular season game scheduled at Elsberry on Saturday. All other tournament games will be played on Saturday at the High School. See schedule below. Ross Seitter drains his fourth three of the game late in the final quarter. Photo courtesy of Red Effect Media. Hermann, Mo. 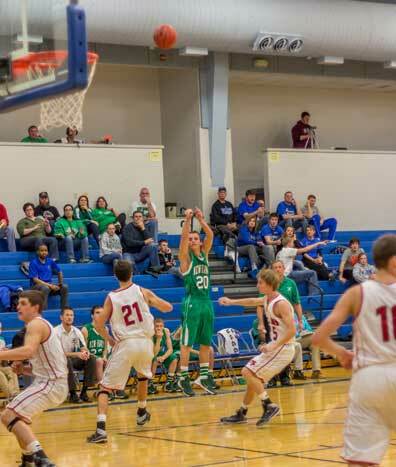 - Tuesday night New Haven’s opening game of the 35th Hermann Boys Tournament were nearly upset by Wright City in a subpar performance shooting just 30% from the field. Despite trailing 17-16 at the half, New Haven held Wright City to eight second half points as New Haven picked up their fifth straight win 38-25, advancing into last night’s quarterfinals against St. James. 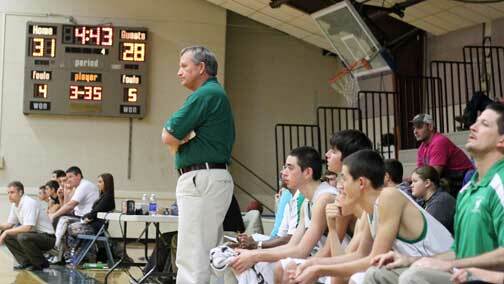 Last night’s battle with St. James would come down to the wire as New Haven had a chance to tie it and force overtime. Hermann, Mo. - Hailey Diestelkamp single handily lifted Owensville over New Haven 58-48 into tonight’s Hermann Girls Basketball Tournament Championship game by setting a new tournament record for most points scored in a single game, putting up 39 points. Wednesday night the two teams battle back and fourth with nine lead changes and 12 ties as they began the fourth quarter and both teams knotted up at 34-34. Diestelkamp finished with a double-double adding 12 rebounds (seven of them offensive boards) and forced six of New Haven’s 15 turnovers in Wednesday night’s quarterfinal. 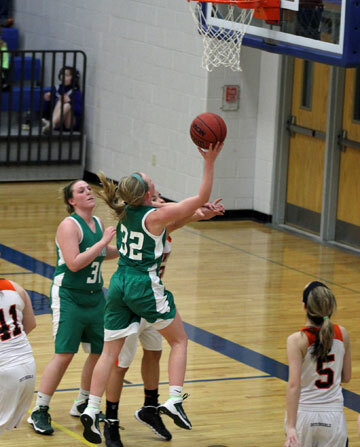 Rachel Steinhoff led New Haven with a team high 21 points followed Kayla Meyer hitting double figures with 11 points. Unforced turnovers and second chance points eventually caught up to New Haven in the fourth quarter and Owensville took advantage. New Haven had the momentum going into the fourth after Steinhoff scored to end the third quarter after driving down the lane and putting up a little floater to tie the game and New Haven starting off the fourth quarter with possession. New Haven, Mo. - Thursday night New Haven picked up their biggest win on the year, knocking off Montgomery County 66-63 led by Kyle Ruediger’s career high 27 points as New Haven improves to 11-3 while Montgomery falls to 13-1. New Haven began scoring the first four points before Montgomery answered to take their only lead of the night, 5-4, which lasted for just 13 seconds. The Wildcats would tie it up seven times and have a chance; down by two with 10 seconds to force overtime after New Haven went just 5-19 from line in the final quarter. Kyle Ruediger kissed it off the glass, was fouled and completed the old fashioned three point play. Ruediger scored in double figures for the sixth straight game. Linn, Mo. - Few teams look forward to playing in the famous unfriendly Linn High School “Dome”. Very nice facility but unpleasant to play at. Tuesday night, led by Kyle Ruediger’s game high 19 points, New Haven out battled Linn 45-38, picking up a big win on the road against a very good Wildcat team. Shamrocks improve to 10-3 with 45-38 win over Linn. Mokane, Mo. - Last night New Haven picked up their second third place finish in as many tournaments, knocking of North Callaway 39-31. 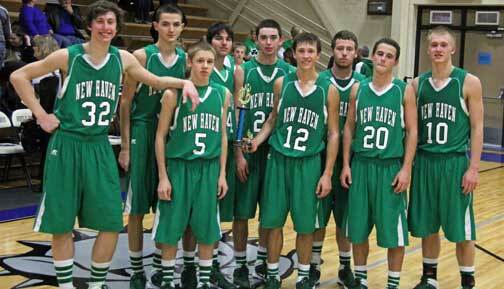 New Haven improves to 9-3 on the year. Pictured above: New Haven after taking first place in the St. James Tournament. New Haven, Mo. 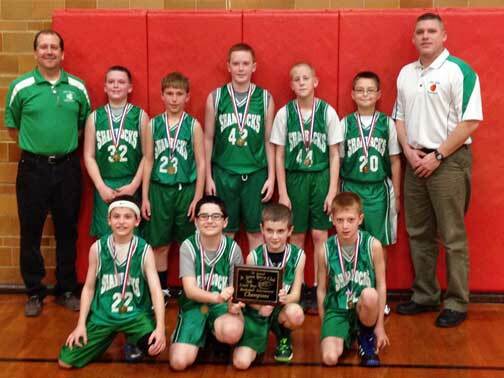 - Last weekend New Haven’s 5th Grade Boys Basketball team captured their second straight tournament championship in as many weeks. 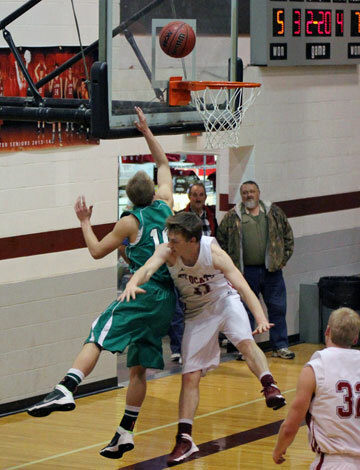 Shamrocks Survive First Round Scare Of South Callaway Tournament. Mokane, Mo. - #2New Haven survived the first round of the South Callaway Tournament 36-32 after #7New Bloomfield nearly pulled off a a shocking upset. Two weeks ago in New Haven’s first game back from Christmas break, they had easily beaten New Bloomfield 56-33, but Monday night was a completely different story. New Bloomfield scored the first six points before Seth Schenck finally put New Haven on the scoreboard with a three pointer at the 4:44 mark. Bloomfield’s aggressive zone defense combined with several unforced turnovers, New Haven found themselves down 11-5 after one quarter. 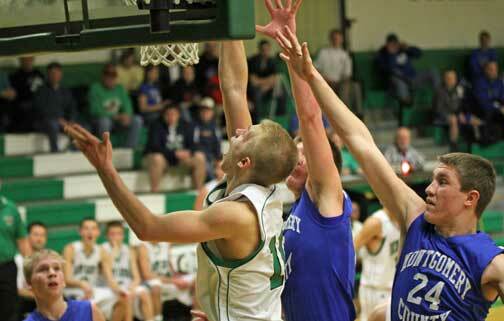 Read more about Shamrocks Survive First Round Scare Of South Callaway Tournament.